*Call or email us for special prices. For those who get there first, the Philips HeartStart FRx Defibrillator is designed to be easy to use, rugged and reliable. On the scene with law enforcement, on the field with student athletes or on the job with employees, the FRX Defibrillator is the solution for treating Sudden Cardiac Arrest (SCA) from ventricular fibrillation in environments and conditions too demanding for many other defibrillators. Philips HeartStart OnSite AED units and HeartStart FRx AED units are widely used in school districts, offices, and police cars. Full Description: For those who get there first. The Philips HeartStart FRx Defibrillator is designed to be easy to use, rugged and reliable for those who get there first. On the scene with law enforcement, on the field with student athletes or on the job with employees, the FRx Defibrillator is the solution for treating Sudden Cardiac Arrest (SCA) from ventricular fibrillation in environments and conditions too demanding for many other defibrillators. The HeartStart FRx Defibrillator carries innovation in its genes. Building on the successes of the other members of the HeartStart family of defibrillators, the FRx brings innovations to the treatment of SCA. SMART Technology, only from Philips At the core of all HeartStart Defibrillators is SMART Biphasic technology. SMART Analysis, a proven Philips technology for heart rhythm assessment, ensures that FRx Defibrillator only shocks when it should. SMART Analysis automatically assesses the victim's heart rhythm and is designed not to deliver a shock unless the rhythm is determined to be shockable- even if the shock button is pressed. What's more, SMART Pads II enable the FRx to keep pace with the responder by adjusting to their actions. 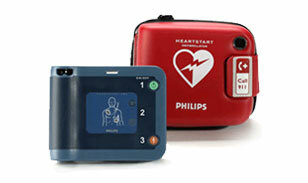 Designed for real world use The Philips HeartStart FRx Defibrillator is exceptionally rugged. Built on a platform of proven ease-of-use The HeartStart FRx Defibrillator was designed to be as easy to use as the HeartStart OnSite Defibrillator and shares many of its features, including CPR Coaching and intuitive icon-driven operation. Although small and lightweight- just 3.5 pounds- the FRx is equipped to guide you though the resuscitation of a SCA victim.